Happy New Year! 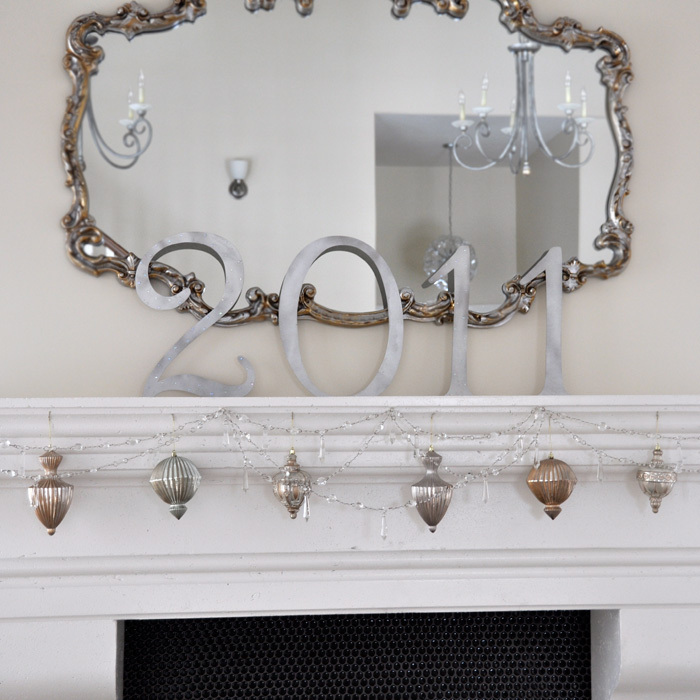 I took all my Christmas decorations down, and my family room was looking really bare, so I cut a large 2011 sign out of chipboard & painted it silver. The ornaments above are from the 75% off Christmas rack at Target. My New Years resolution is to have one new resolution each month two work on. What are some of your goals for the new year? This was such a cute idea Holly. One of my goals is to organize my time better. Gorgeous decor! You're totally making me drive to Target right now to see if I find those ornaments; I'm sure they are long gone. Resolutions? To put myself first on the list. To say NO to commitments more often. To continue getting regular exercise with yoga/pilates. Great decor, Holly! Happy New Year!!! I love this! Stumbled upon the same ornaments and cleaned out my local target clearance bin!! I knew they'd come in handy at some point!!! They're plastic, too, which is fabulous for kids or an active household!!! Love your ideas....fresh and classic!! !